If you have been dreaming of becoming a medical assistant, now is the time to jump into this career. The U.S. Bureau of Labor Statistics says that this field is growing much faster than average, which means you have plenty of opportunities to land a job working with patients and earning a great living. At CBT College we can get you there with a diploma in medical assisting. Once you earn that diploma, typically in less than 12 months, we can help you find a position, but there are some steps you will want to take to make yourself a desirable candidate for the available jobs. By earning a diploma in medical assisting, you will be learning practical, hands-on skills. You will be getting instruction and practice in the exact duties that are expected of a medical assistant on the job. Employers want to see that you have taken this work seriously and demonstrated to your instructors that you mastered the skills needed to do the job. If you excel at your coursework, you will be able to show potential employers that you will be a qualified medical assistant. Participants in the medical assistant program at CBT College complete clinical externships after successfully finishing the coursework. This gives you the opportunity to practice your new skills in a real work setting. It also gives you a chance to make a good impression on future employers. Your performance in the externship is a part of your education, but it is also a way to demonstrate that you can do the job and would be a good employee. You can also use this experience to get a great letter of recommendation to help you during your job search. Practical experience and demonstration of skills are crucial to showing employers that you can do the job of a medical assistant, but you also need to be able to communicate this clearly. To land a great job you need a great resume. As a student here at CBT you can take advantage of our Career Services department to polish your resume and even your interviewing skills. Our experts will help you develop these career skills to get you in the door with your future employer. A job fair is a great way to get your resume out to employers and to start building relationships with the hospitals, clinics, and doctors’ offices in the area. CBT hosts job fairs to help students who are seeking employment and attending these events is a great way to get in the door with employers. In one day you’ll have an opportunity to distribute your resume and even interview with multiple employers, giving you your best chance of finding your dream job. 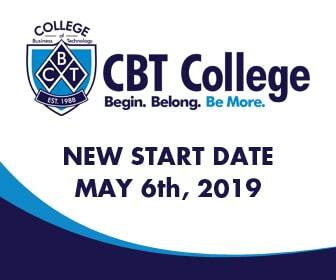 If you are already working on your CBT medical assistant diploma, these tips can help you land the job you have always wanted. If you haven’t started yet, now is the time to get to work on your diploma. With a flexible schedule, you can complete coursework around your current responsibilities and begin your search for a great job as a medical assistant in less than one year.